Published: Dec. 23, 2018 at 01:15 a.m. Published: Oct. 21, 2018 at 06:12 p.m. 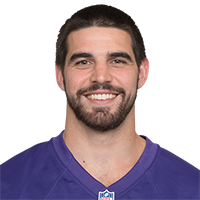 Published: Sept. 13, 2018 at 10:11 p.m.
Baltimore Ravens rookie tight end Mark Andrews catches a 1-yard touchdown pass from Joe Flacco in a Week 2 matchup against the Cincinnati Bengals on Thursday Night Football.